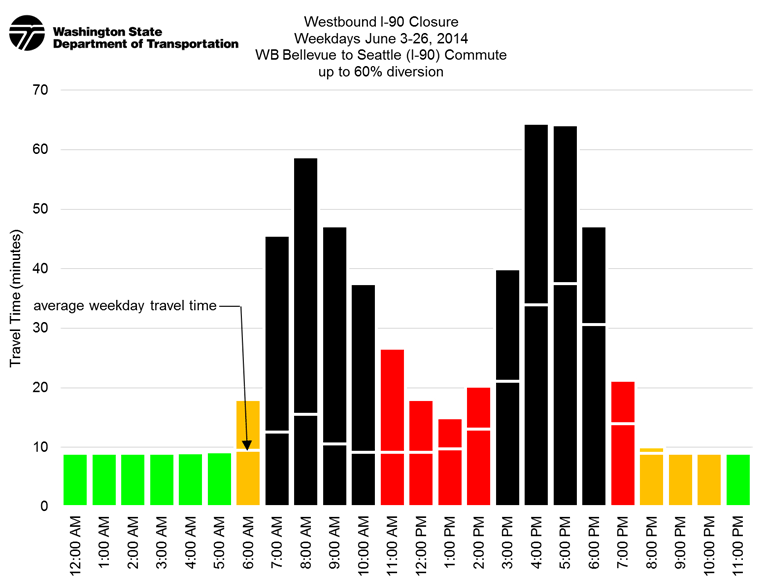 The state DOT estimates commute times could double, triple or worse for bus riders and drivers on westbound I-90 with major construction that will stretch around the clock July 18-25. The cause: all traffic will be funneled into just one westbound lane near Bellevue and Mercer Island 9:30 p.m. Friday, July 18 until 5 a.m. Friday, July 25. Delays also are expected on I-405 and SR 520 – for buses and cars – as traffic tries to find another way around the construction zone. Even if more than half of the typical 85,000 westbound cars avoid the area, travel times that usually are just 15 minutes could still stretch to an hour, according to state estimates. On I-90, there are 13 bus routes that will be affected: Metro 111, 114, 210, 211, 212, 214, 215, 216, 217, 218 & 219, and Sound Transit 550 & 554. But as traffic goes elsewhere (I-405 and SR 520) routes that travel those highways also could face delays. Start planning ahead now and decide if you might instead bike, ride the bus to work earlier, telecommute, take vacation time, join a vanpool or find a carpool. If a person wants to try one of Metro’s nearly 1,400 vanpools across the region, they can help the group earn a one-time $50 gift card — a way to take a car off the road and give this travel option a try. The van decides how to spend the gift card — could be ice cream and iced lattes, depending on the weather. Metro will be working to keep buses leaving on time from the Eastside heading into Seattle, but once the bus is on the road, delays are expected to be long. There won’t be any missed stops or reroutes as a result of this project. The best times to travel are estimated to be before 7 a.m. and after 7 p.m. It will take patience and planning to commute while the state completes this project– described as critical expansion joint replacement needed to keep the highway safe and open for buses and cars.